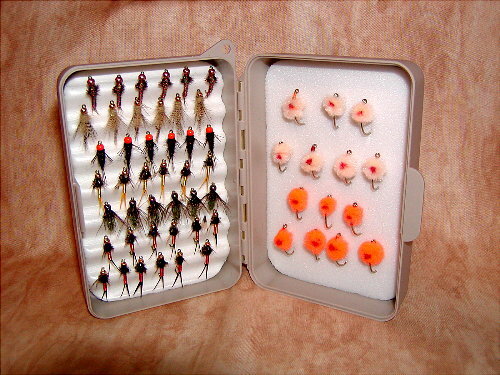 Small fly boxes are excellent for most trout flies in smaller sizes. Each box will hold 4-8 dozen flies comfortably. Large fly boxes are excellent for most trout flies in larger sizes. Each box will hold 8-10 dozen smaller flies comfortably, or 4-6 dozen larger fly patterns. 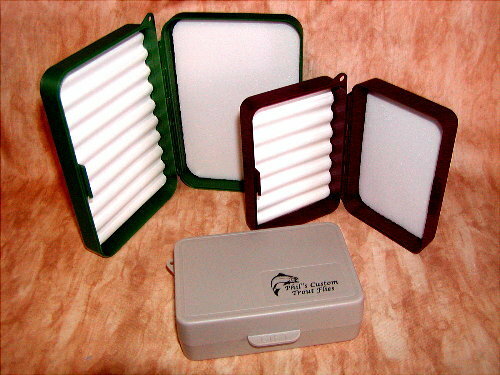 Fly box shown is a small box with 5 1/2 dozen flies for steelhead on California's Trinity River. Nymphs shown are tied on size 12, and Glo Bugs are tied on a size 8 egg hook.